The Blue Unicorn is a member of a magical tribe of Metal Horned Unicorns. Each has a magic power related to the properties contained in their metal horns...all except for Blue. He is just a plain blue unicorn but the tribe must depend on him for something only he alone can accomp... read full description below. The Blue Unicorn is a member of a magical tribe of Metal Horned Unicorns. Each has a magic power related to the properties contained in their metal horns...all except for Blue. 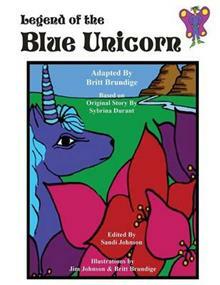 He is just a plain blue unicorn but the tribe must depend on him for something only he alone can accomplish. Join him on a fantastic journey as he goes on a quest to save his tribe. He meets many incredible creatures all across the land...some that want to eat him and some that risk their own lives to help him with his quest.